How Can I Differentiate Content for My Students? How Can I Personalize Resources For My Class? 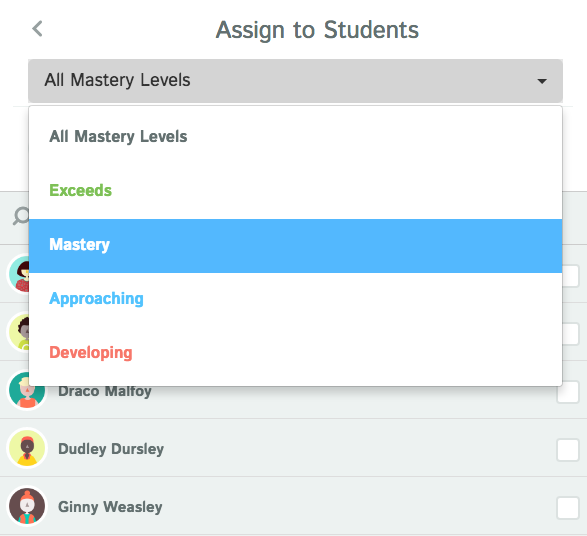 It's easy to send differentiated material to a student or groups of students with Kiddom based on mastery level or grade level. When creating an assignment in Kiddom, you have the option to "select all," to choose a group of students based on mastery level, or pick students manually. This is a great way to provide remediation to students in need and enrichments to students who need a challenge. Kiddom's connected content library allows teachers to quickly search for content by grade level, subject area, assignment type, and keyword. Not only can teachers preview content and assign directly to groups of students, but you can also link other websites to an assignment or upload your own content from Google drive or a computer file. Standards-based grading helps tremendously with differentiation and knowing exactly how your students are performing and what supports to provide. Learn more about SBG and how to incorporate that into your practice.